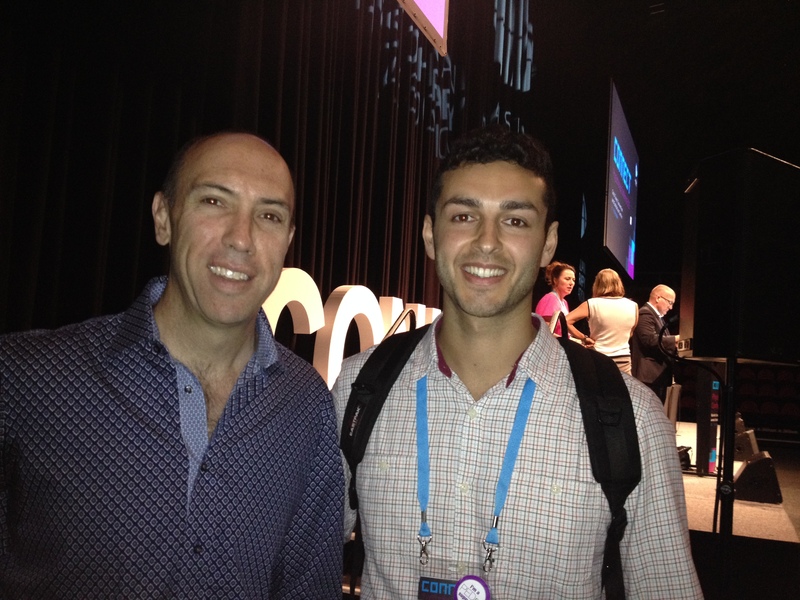 Last week I attended the 2015 APA conference on the Gold Coast and was left with a lot to chew on – not least from the presentations given on pain. Renowned scientists from this sector such as Jo Nijs who presented issues from nociceptive pain to neuropathic pain to central sensitisation. 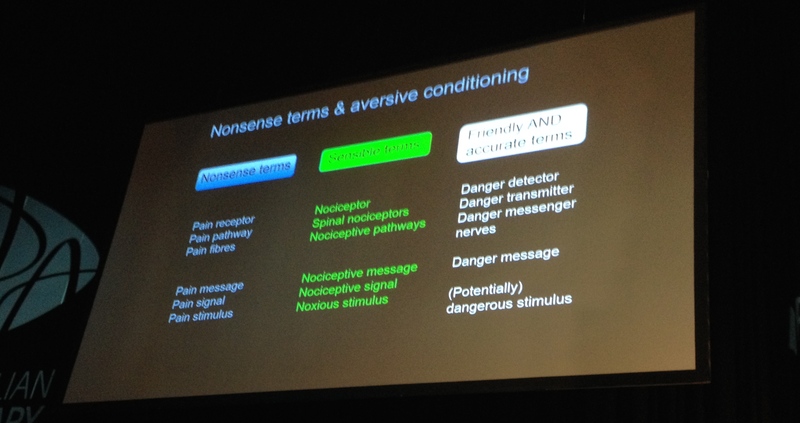 Lorimer Moseley then commented on topics such as patient beliefs, ‘neuroelasticity’, proprioceptive redundancy, neurotags and Imprecision Hypothesis. Lorimers current work is now mainly supervising and running clinical studies which look at healthy subjects to compare with those suffering from chronic pain. His work aims to help therapists to better understand the underlaying mechanisms which modulate pain. My notes below detail and explain his ‘theoretical and clinical considerations’. Pain is an output not an input. Nociception is for protection not damage. Nociceptive signals only have the potential to be dangerous. His mention of ‘neuroelasticity’ is coined as an improvement on neuroplasticity as it conceptualises the ability of the brain to change in a non-permanent fashion. Neuroelasticity implies that with every change there is a certain amount of reversible change that can occur in our neural system. This is called elastic change. Before the change is reversed is is a plastic change. This could be applied to an array of patients from brain injury, central sensitisation, aberrant motor patterns post injury to negative cognitive beliefs. I suppose you could take this further and consider each patient would have an elastic:plastic ratio to consider in rehab. 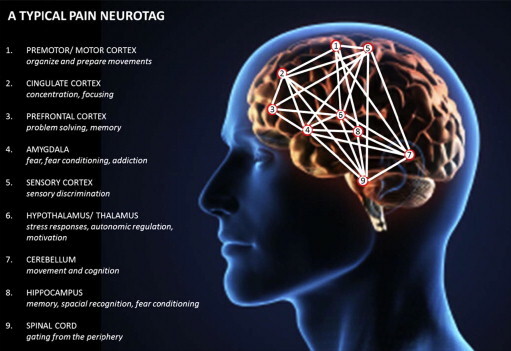 A neurotag is a large population of brain cells which can be neuronal or non neuronal. They work together to produce an outputand are basically a neural representation or a neural signature. They are relative to a persons level of performance and and compete with each other as well as influence each other and the body. These neurotags include our consciousness, thoughts, feelings and feed into the 3 types of primary neuro tags (feeling belief, action). These produce action, movement, cognition, thought, perception and there is a growing body of info what says you cannot change one without affecting another as they are highly intertwined. They affect the onset timing of muscles in tasks, the excursion of our centre of gravity during stationary activities, coordination of muscle during a turn etc. There is a mass of neurotags which create a multi sensory representation that sub serves the protection and regulatory system of the body both physiologically and perceptually capturing feeling, beliefs and thoughts. –> Think about the relationship of feeling stiff and being stiff. –> Safety protection idea – How convinced are we that our body is an unbreakable machine VS an vulnerable precision finely tuned instrument? He went on to talk about how his clinical trials have tested the CBMT with phantom limb amputees. He spoke of how he took a group of them and asked them to use their phantom limb to perform a biomechanically impossible movement (right straight arm ante flexion to 90 degrees with full wrist extension, then getting 360 rotation of the hand). They kept practicing this and eventually many of them could do it. What happened next was interesting, he then asked them to imagine themselves flexing their wrists… and they couldn’t! So they basically had created a new imaginary wrist joint which could operate in the frontal plane, but lost its use in the saggital plane. Study 2 was a 2 point discrimination study around the lower back and how when CLBP patients were tested paraspinally they became markedly worse around the lower back… one example of proprioceptive redundancy. Study 3 was about people with chronic unilateral back pain. They attached vibrating divided either side of the back on the same level and delivered vibrations at slightly different times. They would then ask the patient which side vibrated first and recorded tactile input. The tactile input from the non affected sides was found to produce greater feedback than the affected side… this was considered to be a kind of ‘tactile neglect’ from the painful side. They also did the study with vibration delivered to the hands around the sides of the back and got the same results! This shows that this is a spacial mapping issue. The control group did not show this difference. Imagine a child gets bitten by a black german shepherd. It would be a traumatic event for her and there is a probability that she will develop a fear of black german shepherd dogs. If the child had a photographic memory she would have a neurotag associating that dog with danger in the future and would likely feel fear if confronted with one again. If the child didn’t pay too much attention to the dog and its breed before/after getting bitten then they may just go on to fear black dogs. If the child had not spent much time around dogs at all then they may go on to fear dogs in general. Conversely if the child had been around dogs most of their life, they may have a reduced amount of fear after being bitten when around dogs. If you havent guessed already, this can be related to a patient and how they perceive their pain. Without a detailed understanding of what is happening they have a high mass neuro tag which lacks detail and so becomes generalised. A patient who only remembers bending over and lifting something when their back was injured will associate bending forwards with future injury. If a patient has prolonged multidirectional pain they may develop many negative associations of pain with movement. This pain neurotag can be associated with environments, people, smells, sounds (a busy road, dentists drill etc) and other sensory inputs. A solution? Slowly trim away inaccurate associated neurotags. Peter O’Sullivans CFT approach takes a patient through a progressive movement protocol which aims to reintroduce a patient to movements associated with pain – pain free. 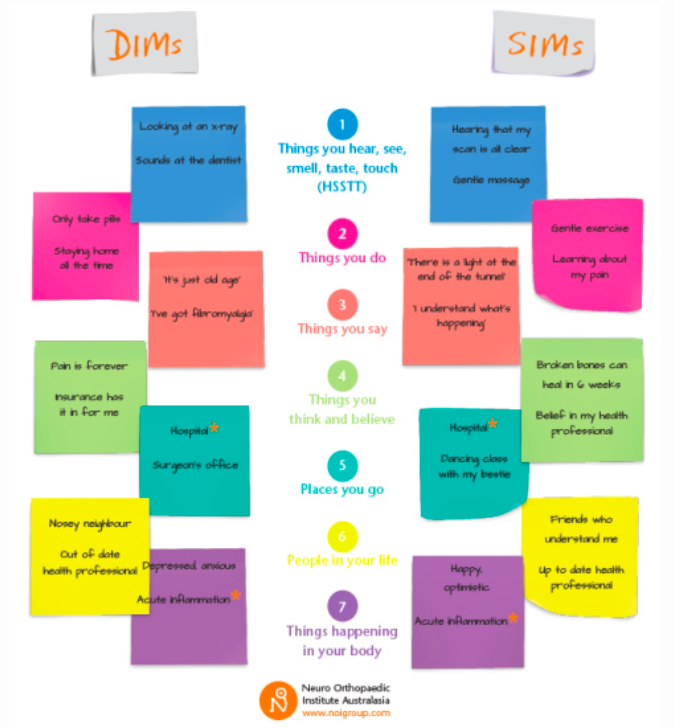 Find and incorporate SIMs (especially when increasing training load). Thank you for reading, visit the JC Physiotherapy Facebook page for more physiotherapy content and posts.